Car buyers often need to weigh two choices: a substantial dealer rebate or low interest rate financing. While low rates may seem attractive, taking the rebate and using it as a down payment can save the customer money. 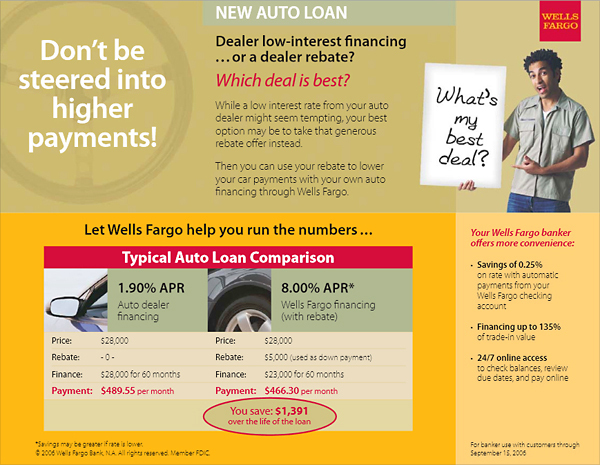 This card was provided to Wells Fargo bankers to help customers compare these options. In the example shown on the card, a rebate instead of low-rate financing saves more than $1,300 in interest charges over the loan term. The card demonstrates these two options, so a banker can easily explain it to customers and show additional benefits of banking with Wells Fargo.